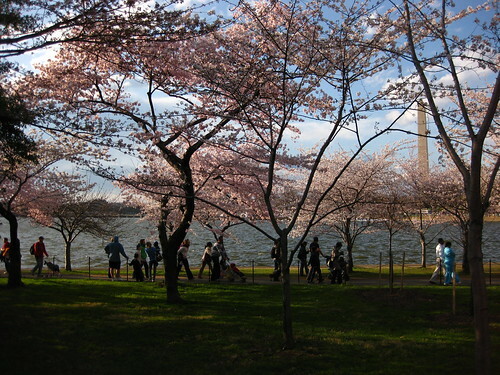 We went to see the Cherry Blossoms last Sunday, just in time to catch an afternoon of decent weather as a storm system left: patchy cumulus clouds with sunny breaks and bouts of strong, refreshing wind. 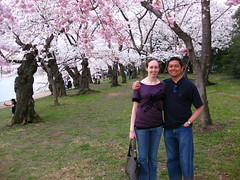 The blossoms around the Tidal Basin were still a few days shy of peak bloom, but certainly more than nice enough to be picturesque. Tourist volume was heavy, as usual, but not as bad as in previous years, and we had no trouble navigating the crowd to nice photographic vantage points. 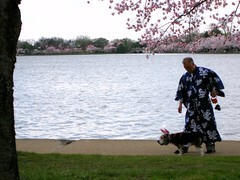 Highlights of the day: man in kimono with bunny-eared dog, equestrian park ranger talking to landscape painter at easel, and of course, the cherry blossoms themselves. Full photoset here.